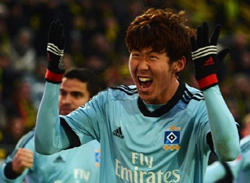 Manchester United have jumped into the competition for young Hamburg star Son Heung-min, the Sunday People reported last weekend. The British weekly called both Manchester United and Chelsea "Son worshippers." "Sir Alex Ferguson's scouts are camped out at Hamburg for the exciting young attacker, who could be sold for around 10 million pounds this summer," it said. The Telegraph recently predicted that Ferguson will replace wingers such as Nani in the summer. The right midfielder has struggled with just two goals in 15 games this season due to an ankle injury and plays the same position as Son often does for the Bundesliga outfit. Meanwhile, "Chelsea -- who would love an Asian idol in their squad -- are also keen on the youngster, whose dazzling skill and goals are being compared to Cristiano Ronaldo," the weekly said.